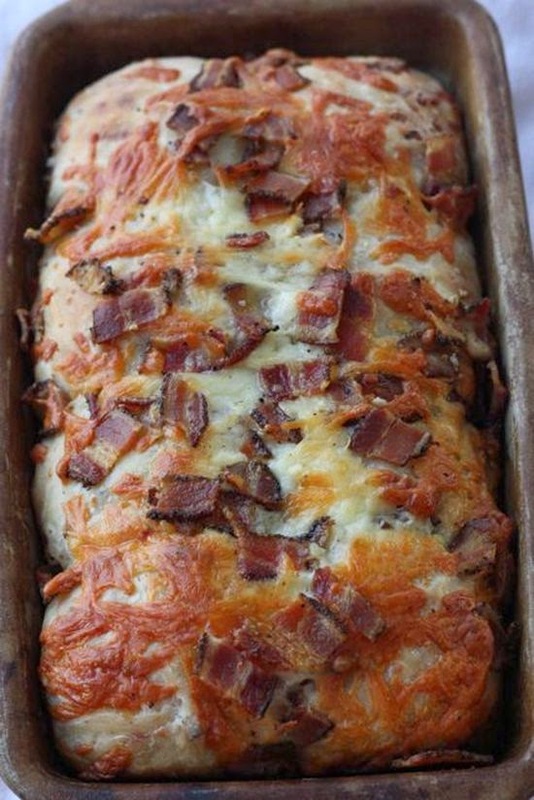 The best bacon cheddar bread you will ever bake..
Add flour, two cups of cheese, ½ bacon and fresh ground black pepper. Stir with spoon until combined. Dough will be shaggy. Don’t stress if it looks messy. It will come together in the end. After an hour, turn dough out onto a floured board and knead for a few minutes. It does not need to be completely smooth. Just knead it long enough to come together. Divide dough into two equal halves and place in standard loaf pans. Cover loaves with remaining cheese and bacon. Cover with towel and allow to rest for thirty minutes. Bake in a 400º oven for fifteen minutes. Cover loosely with foil and reduce heat to 350º and continue baking for another 35 minutes. Remove foil and allow to bake for another 10 minutes.